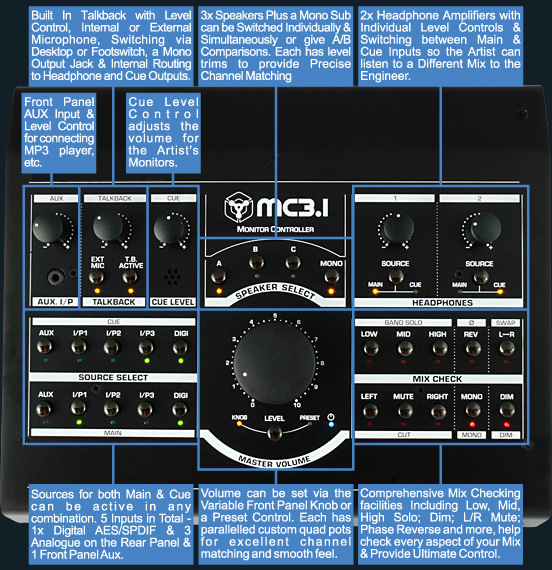 Building on the success of the MC2.1, the MC3.1 Monitor Controller is just as accurate and transparent and of the same build quality. 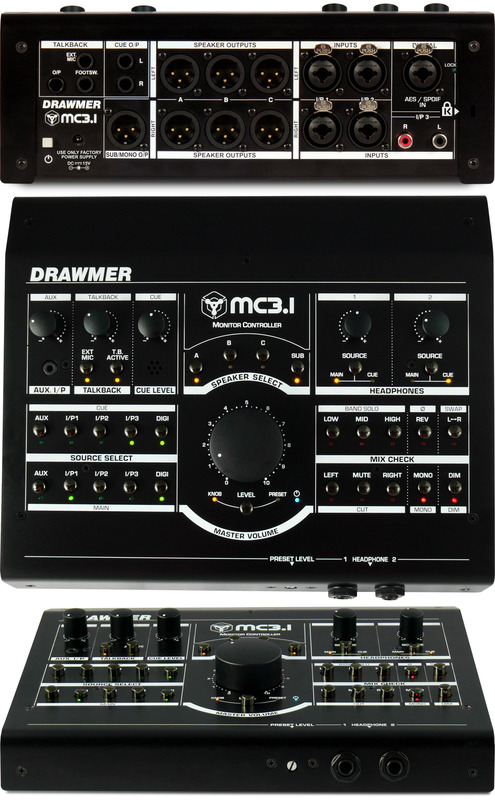 It can still faithfully reproduce what has been recorded without colouring the sound, but comes with a much expanded feature set, including more inputs, better control, extended channel routing and a desk top 'wedge' form factor. Additions include a combined digital AES/SPDIF (24 bit/192kHz) input, giving a total of 5 individually switchable sources, including a front panel auxilary input with level control for the easy connection of your mp3 player, smartphone or tablet. Full cue mix facilities, with level control, provide separate source selection for main or cue outputs and the two headphone amplifiers, so the artist can listen to a completely different mix to the engineer, for example. A dedicated cue mix output is also available. A secondary preset volume control on the front provides repeatable calibrated output level for the monitors, so that at the flick of a switch the engineer can hear the mix at the same predetermined volume, time after time, without having to meticulously adjust controls. The MC3.1 incorporates three stereo balanced speaker outputs, plus a dedicated mono speaker/sub-woofer output each with individual left/right trims under the unit to provide complete control over level matching. Furthermore each can be switched individually and simultaneously and in any order. You can listen to multiple speakers with the same sub-woofer, or turn the sub-woofer off altogether. 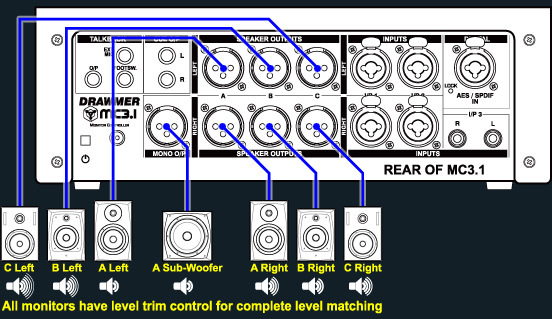 Other improvements include additional mix checking capabilities, which now incorporate low, mid, high solo switches to hear how the lows bleed into the mid, or the stereo width of each, for example, and also the ability to swap the left and right channels. The talkback has been expanded to include an external mic in addition to the internal, and footswitch operation.